Purchase a minimum of $2,500 of hardware, or $500 of cables to qualify. Not enough in stock? No problem! We can ship your large quantity order direct from Tripp Lite's warehouse. These orders typically ship within 2-3 business days. Tripp Lite's High speed HDMI (High-Definition Multimedia Interface) Gold Cable allows interconnection between digital display devices, such as DTV's (Digital Television), Plasma displays, LCD TV's and projectors, to Digital source devices, such as Digital Set-Top boxes, Blu-Ray players and AV receivers. Supports iPad2 Video Mirroring when used with Apple Digital AV Adapter. HDMI assures that the best audio/video signal is always sent from the source (HDTV signal, Blu-Ray Player) to the display (Projection Television, LCD, Plasma, etc.). It does this by allowing uncompressed video and multi-channel audio data to be input to the display device through one single cable. An HDMI connection allows input at high rates of speed, up to 10.2 Gbps. 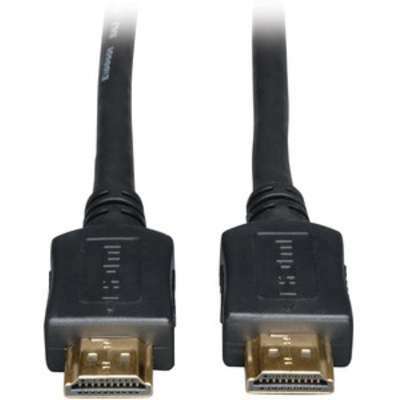 6' high-speed HDMI cable creates a pure digital connection between HDMI-enabled HDTV display devices and HDMI-enabled digital video sources. Gold-plated connectors provide optimal signal transfer for higher quality. Premium Double-Shielded HDMI compliant cable protects against outside noise. Impedance matched twisted pair construction reduces cross talk and interference. Cable supports ultra high-definition (UHD) 4K x 2K video resolutions up to 3840 x 2160. Shop with confidence! Provantage is an authorized Tripp Lite dealer.